If your cat's flea infestation is not severe, you may prefer to fight it the diy, natural way with a homemade herbal flea collar. Certain essential oils naturally repel fleas and are safe for your kitty too; use them to keep your cat itch-free. Essential oils can be toxic to cats, so you must use a highly diluted solution for the flea collar. Never apply essential oils directly to your cat's skin or fur and only buy therapeutic-grade oils to avoid potentially harmful additives. These typically cost between $10 and $20 per ounce and can be purchased at natural-foods stores and online retailers such as Mountain Rose Herbs. One of these therapeutic-grade essential oils: cedarwood, lemongrass, peppermint, rosemary, or thyme. In the mixing bowl, blend two tablespoons of the diluting oil with 12 drops of your selected essential oil. Soak the collar in the solution for 20 minutes. Remove the collar from the solution and let it air dry. Once it's dry, you can put it on your cat. 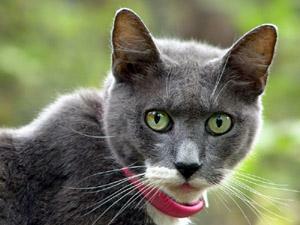 As with all cat collars, keep it loose enough for you to fit two fingers between the collar and your kitty's neck. That way, if the collar gets caught on anything, he can easily pull his head out of it to free himself. If your cat shows any sign of allergic reaction to the flea collar, immediately discontinue use. Essential oils disseminate fairly quickly. You'll need to re-soak the collar about every two weeks or whenever you see signs of fleas on your cat. Since the collar has to dry after soaking, you may want to consider making two homemade flea collars so you always have a spare collar ready to go.